Not to be confused with Grover Cleveland. Grover Cleveland Alexander (February 26, 1887 – November 4, 1950), nicknamed "Old Pete", was an American Major League Baseball pitcher. He played from 1911 through 1930 for the Philadelphia Phillies, Chicago Cubs, and St. Louis Cardinals. He was elected into the Baseball Hall of Fame in 1938. He was portrayed by future President of the United States Ronald Reagan in a 1952 biographical film, The Winning Team. 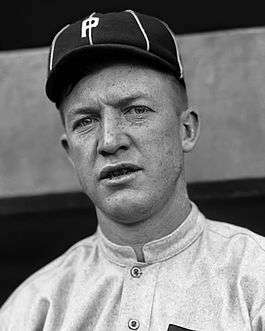 Alexander made his Philadelphia debut during the pre-season 1911 City Series, pitching five innings of no-hit, no-run baseball against the Athletics. He made his official Major League debut on April 15. He was joined on the Phillies that year by catcher Bill Killefer, who went on to become Alexander's favorite receiver, catching 250 of his games. After the 1917 season, the Phillies sold Alexander to the Cubs, ostensibly fearful that he would be lost to the army in World War I, but as Phillies owner William Baker admitted later, "I needed the money". Alexander was drafted and one month before shipping out, he married Amy Marie Arrants on May 31 in a courthouse ceremony in Manhattan, Kansas (the couple divorced in 1929, remarried in 1931, and divorced again in 1941). Alexander spent most of the 1918 season in France as a sergeant with the 342nd Field Artillery. While he was serving in France, he was exposed to German mustard gas and a shell exploded near him, causing partial hearing loss and triggering the onset of epilepsy. Following his return from the war, Alexander suffered from shell shock and was plagued with epileptic seizures, which only exacerbated the problems he already was experiencing with alcohol. Always a drinker, Alexander hit the bottle particularly hard as a result of the physical and emotional injuries he sustained in the war – injuries that plagued him for the rest of his life. People often misinterpreted his seizure-related problems as drunkenness. In spite of all this, Alexander gave Chicago several successful years and won another pitching triple crown in 1920. Tiring of his increasing drunkenness and insubordination that was often directly related to his epilepsy, the Cubs sold him to the Cardinals in the middle of the 1926 season for the waiver price. Then-Cubs manager, Joe McCarthy stated the reason for the sale was, "The Cubs finished last last year and if they finish last again, I'd rather it be without [Alexander]." The origin of the nickname "Old Pete" is something of a mystery. It is uncertain how frequently Alexander was publicly called by that nickname during his playing days. On his 1940 Playball baseball card he was referred to as "Ol' Pete." In The World Series and Highlights of Baseball, by Lamont Buchanan, published in 1951, the year after Alexander died, on pp. 106–107 the author refers to "Pete Alexander" and "Ol' Pete" in a matter-of-fact way, suggesting the nickname was well known. When he won his 373rd game on August 10, 1929, one newspaper had called him "old Pete", indicating that the nickname was in public circulation. Alexander is mentioned in the Leave It to Beaver third-season episode "Ward's Baseball" in which Ward has a baseball with several autographs and Alexander's is one of them. 1 2 3 4 5 6 7 Fiero, John W (2002) . Dawson, Dawn P, ed. Great Athletes. 1 (Revised ed.). Salem Press. pp. 32–34. ISBN 1-58765-008-8. ↑ Weatherby, Charlie. "The Baseball Biography Project: Bill Killefer". Society for American Baseball Research. Retrieved July 17, 2010. ↑ Lawrence Ritter. The Glory of Their Times. Collier Books. p. 236. ISBN 0-688-11273-0. ↑ "Alexander Ignored At Yankee Stadium Where He Beat Great Bronx Bombers". Hartford Courant. 1950-10-07. p. 12. ↑ "Sport: Old Pete". TIME. 1950-11-13. 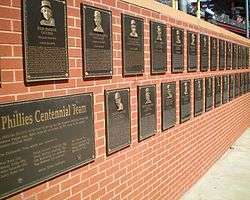 ↑ Baseball's 100 Greatest Players (The Sporting News). Baseball Almanac. Retrieved 2011-08-25. ↑ Racing Redbirds: A Video History of the St. Louis Cardinals from 1882 to Present. 1983. ↑ "Grover Alexander and Bride Visit Home Folks". St. Paul Phonograph, St. Paul, Neb. April 24, 1919. ↑ Stump, Al (1994). Cobb:A Biography. Chapel Hill: Algonquin Books 1994. ISBN 0945575645. Wikimedia Commons has media related to Grover Cleveland Alexander.